Charlie Kaufman's acclaimed comedy won't be available on Blu-ray until the end of January. As previously reported, Image Entertainment was preparing 'Adaptation' for Blu-ray on December 6, but now the release seems to be coming January 31. Spike Jonze directs Nicolas Cage as a lovelorn screenwriter who turns to his less talented twin brother for help when his efforts to adapt a non-fiction book go nowhere. The film was nominated for four Academy Awards including Best Actor (Nicolas Cage), Best Supporting Actress (Meryl Streep), Best Adapted Screenplay, and Chris Cooper won for Best Supporting Actor. The Blu-ray will feature 1080p video, a DTS-HD Master Audio 5.1 soundtrack, and the only supplement announced so far is the theatrical trailer. 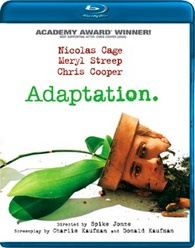 You can find the latest specs for ' Adaptation' linked from our Blu-ray Release Schedule, where it's now indexed under January 31.